Strategic technology management; Invention, innovation, improvement, integration; Strategy formulation I: scenario planning; Strategy formulation II: systems thinking; Strategy implementation; Summary; The case studies. 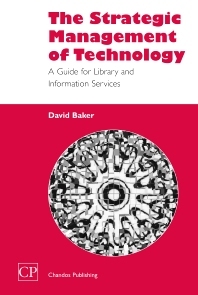 Aimed at professionals within Library and Information Services (LIS), this book is about the management of technology in a strategic context. The book is written against a backdrop of the complete transformation of LIS over the last twenty years as a result of technology. The book aims to provide managers and students of LIS at all levels with the necessary principles, approaches and tools to respond effectively and efficiently to the constant development of new technologies, both in general and within the Library and Information Services profession in particular. It looks at the various aspects of strategy development and IT management, and reviews the key techniques for successful implementation of strategy and policy.